Provide comfort for the family of Arvie Keene with a meaningful gesture of sympathy. 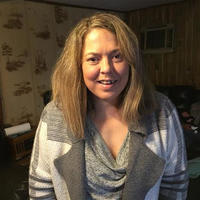 Arvie Charlot Keene, age 46, of Shelbiana, KY passed away Sunday, April 14, 2019 at her home in Shelbiana, KY.
Arvie was born March 4, 1973 in Pikeville, KY to Lloyd Douglas McCown and Loraine “Coleman” McCown. Arvie was preceded in death by her father: Lloyd Douglas McCown; her son: Chase Raines Keene; her sister: Lori Elizabeth Hammond; and a special uncle: Jimmie Coleman Jr.
Arvie is survived by her loving husband: Randall Keene; her loving mother: Loraine “Coleman” McCown; her son: Devin Douglas Keene, of Lexington, KY; her sister: Terina Marie McCown; a special nephew: Brandon Douglas Hammond; three special aunts: Janice Jones, Patricia Coleman, and Wanda Coleman; several step children, several step grandchildren, and several step great grandchildren, and a host of other family and friends. Arvie will be deeply missed by all who knew and loved her. The family will accept friends at the Thacker Memorial Funeral Chapel, Tuesday, April 16, 2019 at 6:00 PM, and Wednesday, April 17, 2019 with services beginning at 7:00 PM nightly. Funeral services will be Thursday, April 18, 2019 at 1:00 PM. Jimmy Jack Adkins and Chris Bartley will be officiating. Interment will follow at the Annie E. Young Cemetery, Pikeville, KY.
To send flowers in memory of Arvie Keene (McCown), please visit our Heartfelt Sympathies Store. We encourage you to share your most beloved memories of Arvie here, so that the family and other loved ones can always see it. You can upload cherished photographs, or share your favorite stories, and can even comment on those shared by others. Provide comfort for the family of Arvie Keene (McCown) by sending flowers. Arvie you will surely be missed! Randall , Devin, and family I’m so sorry for your loss. Our loss is Heaven’s gain! Arvie was such a sweet , humble, and caring person. I wish I had known her longer. RIP Arvie love you sweet lady! !